36 complications, 25 of them visible, 1,483 components, a 1000-year calendar, a price tag of 2.7 million dollars, and 5 years’ work: what others have simply dreamed of, Franck Muller has made a reality! Never has the Maison de Haute Horlogerie better deserved its name of “Master of Complications”, pulverizing the record number of complications ever housed in a single wristwatch. The challenge for the Master Watchmakers of Genthod was enormous: how to embed all the complications known to this day in a watch that was designed to be worn. The Aeternitas movement served as a base, while the Mega 4 represents the apotheosis of the art of watchmaking with its grand and small Westminster chime striking-work, the only one available on the market with a tourbillon visible on the dial. Added to this are a minute repeater, a mono-pushpiece split-seconds chronograph, a perpetual calendar secular, and an equation of time which only varies by 6.8 seconds per lunar month, the equivalent of one day every thousand years! Although the first piece of this exceptional, limited series was presented to an American collector at a ceremony in Monaco last November, the Master Watchmakers of Genthod are already putting the finishing touches to a second Aeternitas Mega 4, which will be available in the very near future. And for all those who would like to share the dream of Franck Muller’s creations first-hand, the Master of Complications has organised two WPHH – World Presentation of Haute Horlogerie – exhibitions this year at its Watchland site in Genthod on 17-23 January and 17-27 March from 9.00 a.m. to 6 p.m.
Franck Muller will be offering watch professionals and the international press a comprehensive view of its seven brands: Franck Muller, Pierre Kunz, ECW, Rodolphe Montres & Bijoux, Barthelay, Backes & Strauss and Martin Braun. The new collections will be exhibited in purpose-built pavilions, with elegantly arranged stands, sophisticated design and contemporary decor meeting the most stringent demands. More than 5,000 visitors and 600 journalists are expected during the two exhibitions. This prestigious event is a must for both professionals and haute horlogerie aficionados! The Aeternitas Mega is the pinnacle of success in the art of watch-making in terms of complexity and complications. A grandiose work of art culminating in the design of the most complex wrist watch ever made in the world thanks to the multifaceted skills of our watch-makers and constructors. Each of the 1,483 components was designed to give the watch an elegant design in the pure traditions of the old “cadraturiers” (the mechanisms located under the dial) of the Vallée de Joux, Switzerland. This watch inspires countless emotions as an exceptional time piece and simply unique in the eyes of lovers in the art of fine mechanics and luxury watch making. From the very beginning, the Mega was incorporated in to the Aeternitas project and is, indeed, the culmination of this project. 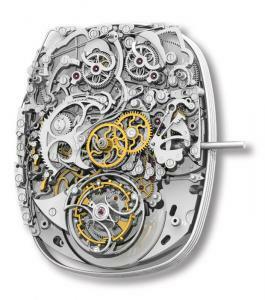 The basis was always the same, an automatic Tourbillon, but, with two motors. The plate has been hollowed out on the dial side to hold the striking mechanism. In comparison to the Aeternitas versions, the four Aeternitas Mega versions only have a thickness of 0.2mm as it had to accommodate the striking mechanism of the “Chime of Westminster”. The Mega sets itself apart thanks to its “Grande Sonnerie” Chime of Westminster striking mechanism sounding on the hours and quarter hours. In the “Petite Sonnerie” version, the strike on the hour is removed, and it only sounds on the quarter hours. The programming of the large and small striking mechanisms is done through simple pressure on a waterproof push-button placed at the 10.30 mark on the watchcase. This push-button programmable function enables the movement of the striking mechanism to be stopped. The minute repeater enables the “Chime of Westminster” to be activated at any time, and so giving the complete strike of the hours, the Westminster quarters and the minutes. The “Grand Sonnerie” is the only watch in which the Tourbillon is visible on the dial side, which limits the space available for the “Grand Sonnerie” mechanism and thus makes the design even more complicated. The glass sapphire case back enables the harmoniously chiselled and decorated pieces that overlap to be admired in a stunning combination as a dazzling ballet. 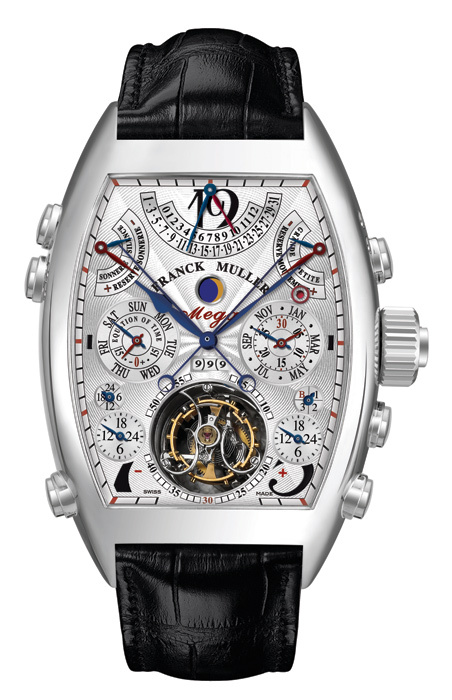 This masterpiece of complications and know how was entirely designed and manufactured by the Franck Muller group and once again demonstrates their vast array of skills and ability in the Art of HAUTE HORLOGERIE. 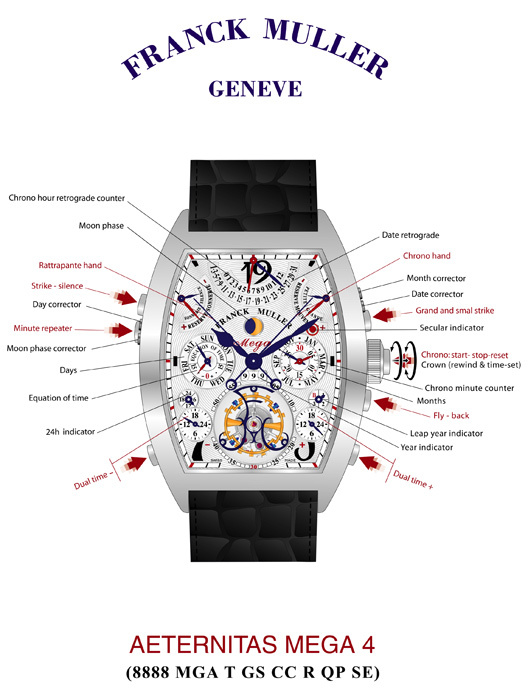 Côtes de Genève, diamond polishing, hand-bevelling, circular graining, bi-colour rhodium-plating and hand-engraving. Hours, Minutes, 24 hours, Chronograph, Fly-back, Minutes counter, hour counter retrograde, two time zones, Movement power reserve. Chime or silence. Chime power reserve. Date retrograde, Day, Month, Year, Leap year (cycle of 4 years), no leap year (cycle of 100 years), leap year (cycle of 400 years), Equation of time. Sun-stamped translucent lacquered white dial. Cintrée Curvex 8880, 18 karat white gold.